Coal provides more than half of the nation’s electricity and considering that the United States controls an estimated quarter of the world’s coal reserves, it makes coal a cheap and abundant energy source for the foreseeable future. As coal demand grows, so does the amount of byproducts from burning it. Millions of tons of “fly ash”, a powdery substance laced with heavy metals such as arsenic, mercury and lead, have piled up leading to costly disposal for coal power companies. Fly ash, also known as flue-ash, usually refers to ash produced during combustion of coal. Fly ash is generally captured by filtration equipment before the flue gases reach the power plant’s chimney. In the past, fly ash was generally released into the atmosphere. Today, many mandates now require that it be captured. In the US, fly ash is generally stored at coal power plants, moved to landfills or recycled. To be in compliance with EPA mandates, most of the country’s over 400 Coal burning power plants employ a pneumatic conveying system to remove fly ash. These systems typically contain massive disc valves or rotary airlocks to safely and efficiently feed and meter the fly-ash into bins for the next step of their particular process. High internal temperatures, pressures, and pressure maintenance demands, require that these rotary airlock feeders function reliably to ensure ash handling efficiency and maintain environmental compliance. Due to the very abrasive nature of most fly ash, the engineering and construction of these rotary airlocks must be able to withstand ongoing contact with this incredibly harsh material. 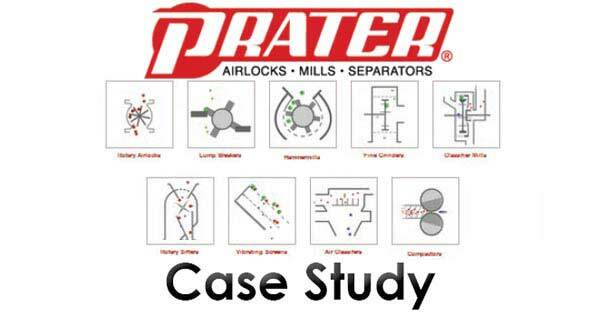 The Abrasion Resistant Series Airlock, considered Prater’s most durable valve, is frequently chosen to handle highly abrasive materials, such as alumina, coke, fly ash and glass frit. The Abrasion Resistant Series Airlock lasts 3 – 5 times longer, compared to chrome and Ni-hard-coated. High-performing, thick-wear layers of ceramic tile coating throughout the airlock maintains the Airlock’s precision tolerances significantly longer than others and make it ideal for the feeding and metering of fly ash. The AR Series Airlock ensures up to +/- 12 PSI pressure differential and, depending on the type of ceramic used, can withstand temperatures up to 1200°F and is the best choice for handling highly abrasive or corrosive products. Constructed from either cast iron or stainless steel, the AR Series Airlock is fully equipped with eight-blade rotors with your choice of speed and square sizes of 6, 8, 10, 12, 14 and 16 inches. Its heavy cast iron houses, oversized mounting flanges, heavy-duty outboard bearings, Prater’s exclusive self-adjusting packing glands and pre-drilled end plates provide superior air purge capabilities. Additionally, ceramic options include ceramic-lined end plates, Tungsten-coated or AR 400 rotors and tungsten carbide throat assuring less downtime, greater profitability and a safer work environment during the fly ash capturing process.